CadMouse Wireless is not just another mouse: Developed for mobile workstations, it is a professional tool for high performance, precision and comfort in CAD and 3D applications. Modern engineering and mobile workplace concepts demand powerful yet portable equipment. 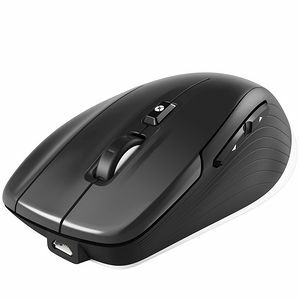 With the CadMouse Wireless users benefit from CAD-specific features such as the dedicated middle mouse button and the smart mouse wheel in one compact, wireless mouse. The high precision, energy saving optical sensor ensures that the mouse cursor is aligned with your intention, thanks to the resolution up to 7,200 dpi and the adaptive polling rate up to 1000 Hz (via USB connection). The best thing is: Despite these high performance specifications, the CadMouse Wireless can work up to two months on just one battery charge. There are three kinds of ways to connect the CadMouse Wireless. Users can easily switch between the 3Dconnexion Universal Receiver with 2.4GHz wireless technology, Bluetooth or USB cable for parallel charging the Li-Ion battery. There are two features, which support working in CAD applications particularly effectively: the smart mouse wheel with SmartScroll function and the QuickZoom thumb buttons. SmartScroll recognises the actual application environment and automatically delivers the right kind of scrolling: precise, click-to-click zooming for CAD applications or speed scrolling with inertia effects in browsers and documents. QuickZoom allows users to zoom in and out of the centre of details with a single click of a thumb button. Simply keep pressing the button to fine-tune the zoom level until the desired view is reached. The gesture button opens an application or environment-specific radial menu, which gives direct access to up to 8 of your favourite commands for each application or environment. Simply activate those commands with a mouse gesture. Either by swiping the cursor over the command or clicking on it directly. The CadMouse Wireless has optimally shaped PTFE feet. These ensure smooth and fluid mouse movements thanks to an almost perfect equilibrium between static and kinetic friction. Their shape also helps to damp vibration. Mobile working involves frequent changes of location. While travelling, it is essential to protect your devices. For this reason, 3Dconnexion delivers the CadMouse Wireless with a compact and lightweight carry case. 3DxWare 10 is the all-in-one driver for all 3Dconnexion devices. Its simple yet powerful user interface allows the CadMouse Wireless to be customised and optimised to your work style, for each separate application and environment.